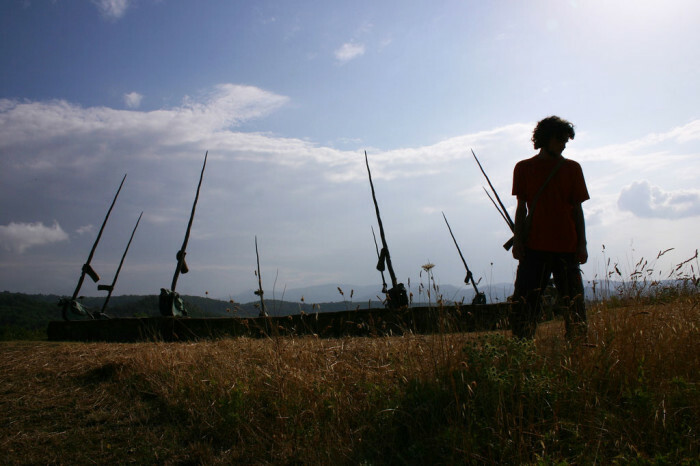 On the hills of the Amiata mountain, in a rather remote part of Maremma, there’s a large sculpture park by the Swiss artist Daniel Spoerri. The vast area includes woods as well as open fields, and is home to 108 sculptures, over 40 of which are by Spoerri, and the others selected by him for this space. The garden evolves with new works most years, as well as with the seasons, making it a fascinating open-air art experience. The ArtSmart Travel Roundtable this month is talking about “an art day” and I remembered a 2010 visit to Spoerri’s park as a marvelous day out. You arrive by passing through the Crete Senesi and onto the Amiata mountain, so the trip itself is a treat for the senses. The park itself is large, taking about three hours for a proper visit, at the end of which one might have a picnic or a bite at the on-site bar. I like the idea of taking an “art day”, even if it’s not part of a larger trip – a day dedicated to the visual, with treats for the other senses as well. Spoerri, now 84 years old and still going strong, is an important theorist who was in contact with a number of surrealist artists (in particular Marcel Duchamp) and was part of the New Realism and Fluxus movements. He’s most famous for his “snare pictures,” moments of everyday life frozen in time, often displayed on a vertical plane – such as a leftover breakfast, now on the walls of the MOMA in New York. He was a pioneer in the 1960s in the creation of works that challenge the meaning of art. 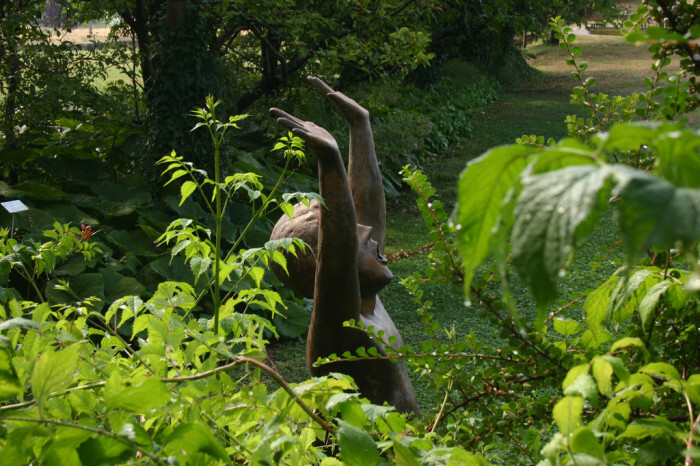 Chance is one of the major themes in his works, and at the Giardino di Daniel Spoerri there’s an important work that is connected to others he made on the same theme. Imagine this: in the middle of the woods, you come across a bronze cube that is partially open – you can peek through a door and a window, and it has no roof, letting in light, rain and leaves. 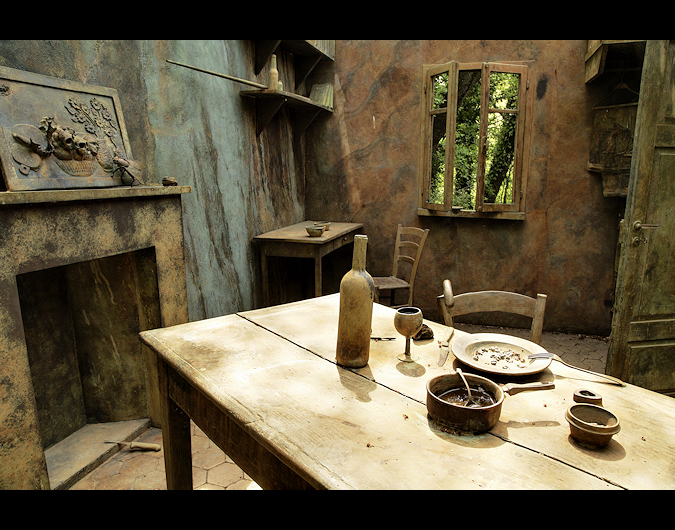 Head inside and you find yourself in a precise replica of the space in which Spoerri was living in 1961. Called “Chamber No. 13, Hotel Carcasonne, Rue Mouffetard 24, Paris,” this replica was made of bronze in 1965 and assembled here in 1998. How did the artist remember this scene? In 1962 he held a show in Paris and he created a map of his lodgings, which he called “Anecdoted Topography of Chance”. 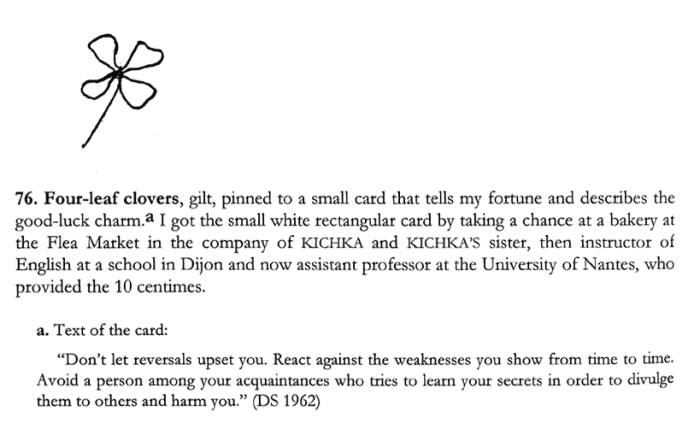 Each item tells a story, sometimes long, about which the artist wrote in a pamphlet an accompanying book to which four other fluxus artists subsequently contributed. The text is a fascinating document not only of the artist’s life, but of the thought process of and collaboration between artists of this period. The hotel room is amongst the most notable and probably most theoretical works in the park. 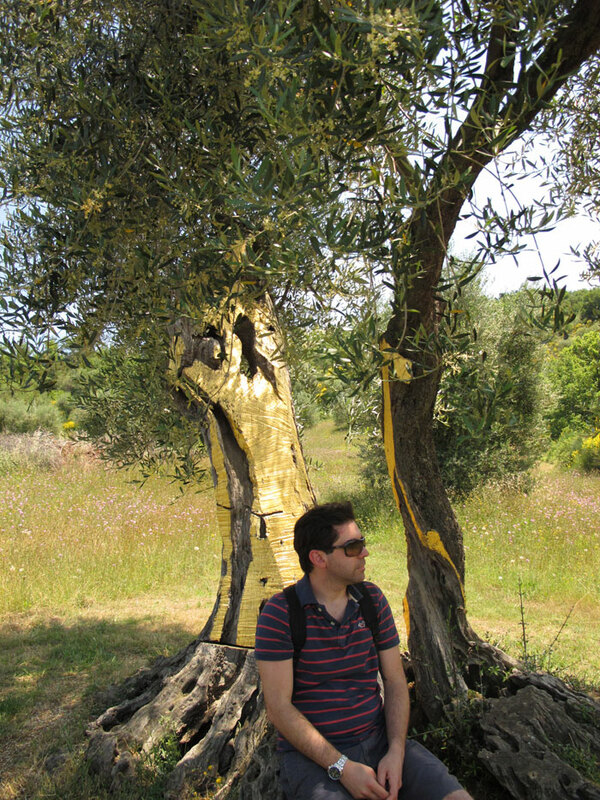 Many of the others are more discreet – like an old olive tree, naturally split in half, the trunk of which has been gilded by artist Dan Karavan. It’s natural art – you only really notice it when the light hits in the right way. 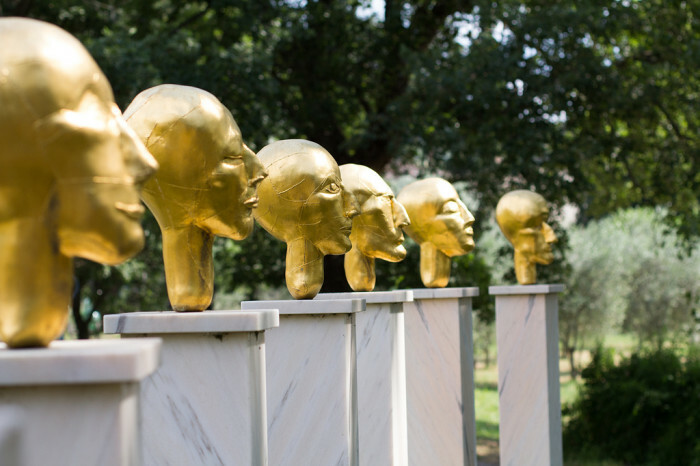 Some sculptures, like these gilded heads by Eva Aeppli representing the planets, stand out on marble pedestals, but many other works by the same artist or by others are practically hidden within their natural setting. Numerous works can be found near or attached to the pink-painted house on the property. 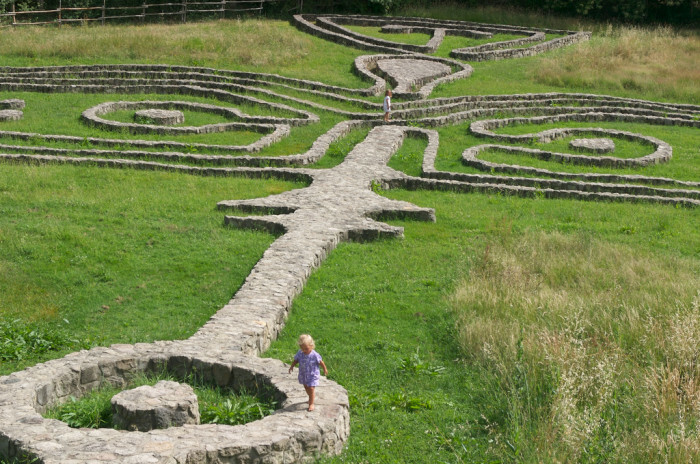 Just behind the building, Spoerri has built a flat “Labyrinth” (1996-98) inspired by a pre-columbian design incised in rock intended to show the link between Father Sun and Mother Earth. Further “afield”, where the property comes out of the woods and opens into a high-laying plane, there are three interesting works that make use of the open space. The Circle of Unicorns by Spoerri seems to invite, or be the product, of some kind of primitive ritual. 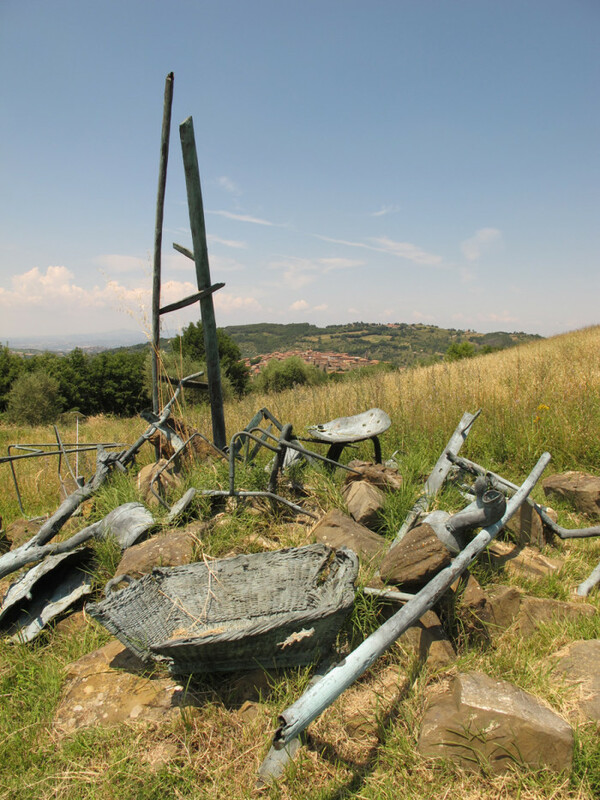 La Belle Poubelle by Katharina Duwen, is a fascinating rubbish heap with a view. 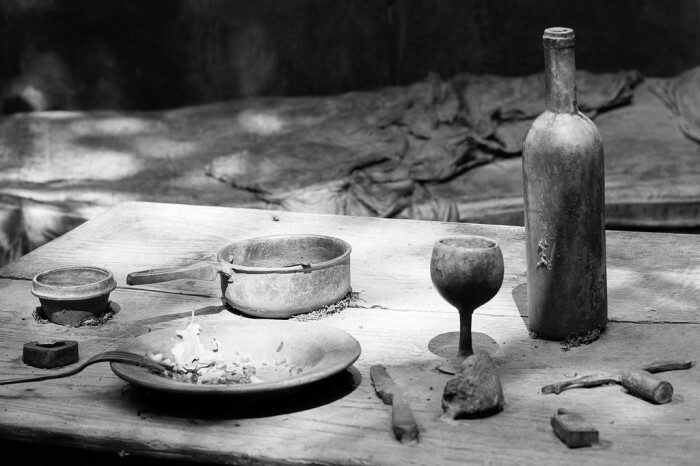 It’s hard to tell if these are artist-made replicas like Spoerri’s hotel room, or if it is truly rubbish that has been artfully dis-arranged. And what of the geese? 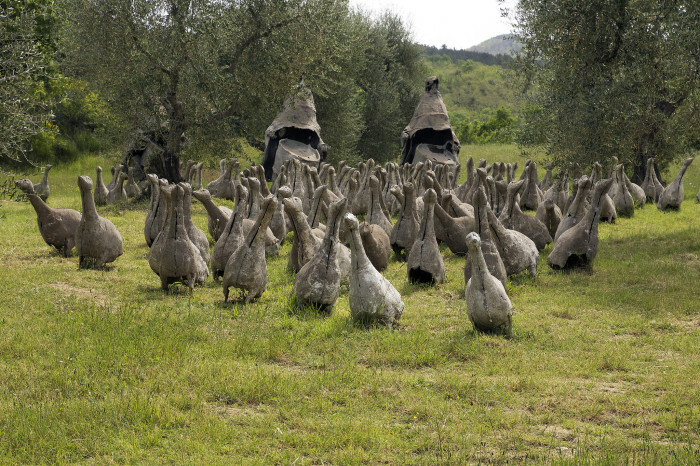 Olivier Estoppey’s 2001 march of geese to the beat of drums on judgement day is charming to look at but scary as a theme. In fact, many of the works in the park deal with dreams, nightmares or death. More positive themes can of course be found here, and the art ranges in style and medium, though it’s all curated by Spoerri himself, who comes for extended stays some four times a year. It’s entirely possible to meet him in the park. Open daily 11am to sundown. Closed Mondays. In winter (November to March), by appointment only. Each month, bloggers who write about art and travel get together to explore a common topic. This month it’s “an art day”. Check out what the others have to say on art days in a number of fascinating locations.